The 6″ Pixel 2 XL can be purchased either unlocked to work with GSM carriers or can be purchased with a Verizon SIM. Prices start at $849 with 64GB of storage on board in either Just Black or Black & White, often referred to as The Panda. Payment plans are available too and start at $35.38 per month for 24 months with approved credit. Finally, for those of you on Project Fi, you get a similar deal. 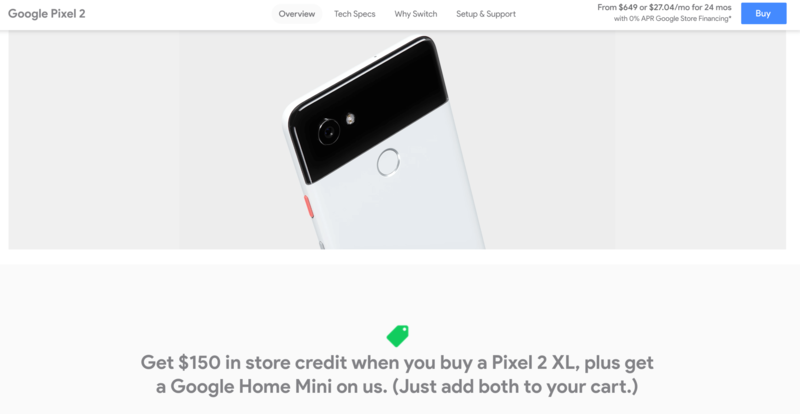 If you buy or upgrade to the Google Pixel 2 XL, you get $150 in Fi credit on your bill but it doesn’t appear that the free Google Home Mini is an option. To get more details or to order, head over to the Google Store.